J R Flooring is owned by Pat Rutkoski, with over 30 years of experience J R Flooring offers the best in quality and reliable service. 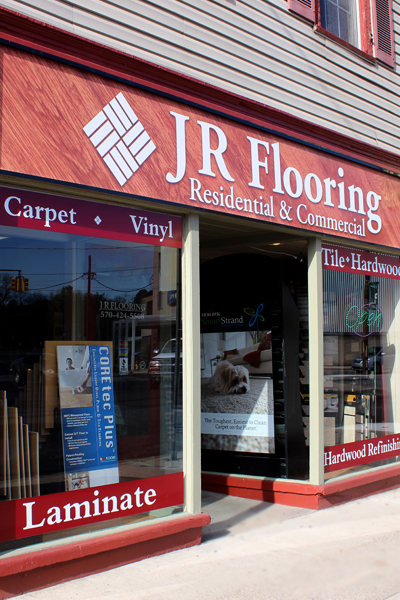 At J R Flooring from the moment you walk through the door we guarantee great service, from your initial consultation or visit, to the installation of your flooring, to follow up service after the work is complete. From the moment you enter our Washington Street showroom in East Stroudsburg, you will find friendly service, a hometown smile and the promise to get the job done in time and on budget. All of our services are only the best quality - from our professional installers to the fine quality of our products. We offer a variety of products all on display in our showroom including: carpet, ceramic tile, hardwoods, laminate and vinyl flooring as well as environmentally-friendly bamboo and cork. J R Flooring is a full service store providing both products and installation services for both residential and commercial purposes.